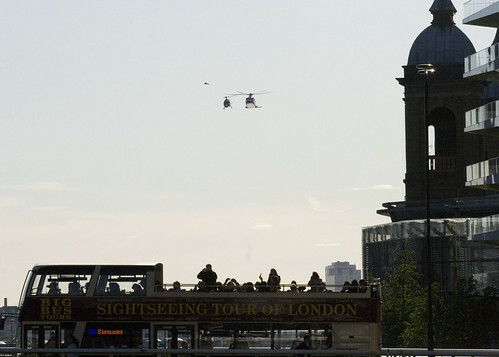 A large number of people enjoying the evening sunshine, and a modest number of those in the know were treated to the rare sight of a couple of helicopters flying through Tower Bridge last night. 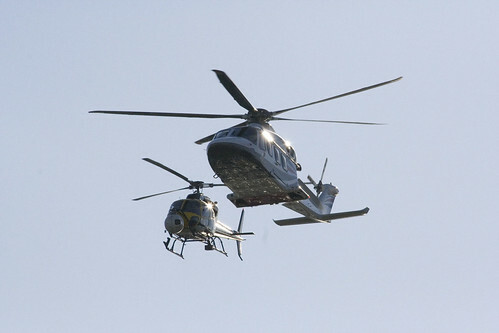 Two helicopters – one filming, the other the “star” had spent the past couple of days filming along the Thames, but were to conclude with a dramatic fly through at some point on Saturday evening. The difficulty was knowing exactly when, and in which direction. 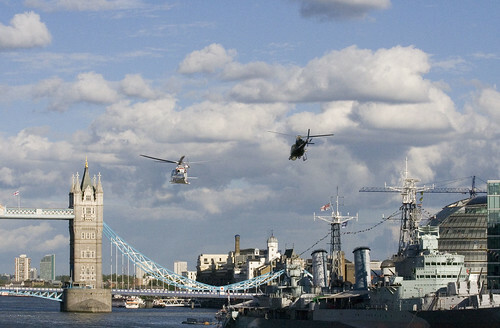 We had fortunately been warned by Twitter that the flypast was due to take place at 6:45pm, and when I quizzed one of the film crew on Tower Bridge he had no idea if that was correct, but blanched most noticeably when I mentioned that the filming window went on to 10pm. So it was going to be early then. Presuming that lots of people would be closer to the Bridge, I positioned myself on a raised, and slightly private walkway near London Bridge that has the advantage of being able to look over most of the boats. Either I get the helicopters flying towards me (best option) or could get some close up photos of them flying away (not so good). Loitering around for a while was joined by a professional photographer who was there to get some photos of the area and had no idea that a helicopter stunt was due to take place. Just before the suggested time, a harbour master boat moored up to stop other boats getting in the way, which was a good clue that things were about to start. I casually mentioned to some teenagers around the corner that they might want to watch this, and was asked if I could tell them a bit closer to the time. Mentally cursing their laziness that standing for 10 minutes is too much hassle, I just told them to hang around. Approaching from the West came the larger helicopter, resplendent with the Union Jack* at one the back, and a filming helicopter flying just behind. 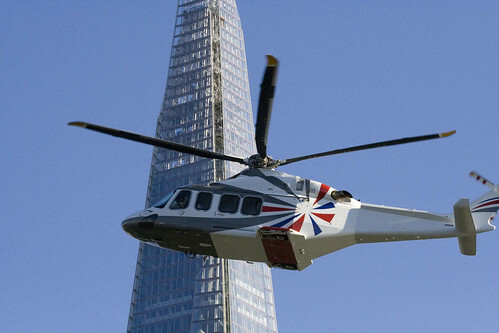 Swooping down low over London Bridge, the duo sunk down into the Pool of London, swept past HMS Belfast and approached Tower Bridge, which was now cleared of people. Sweeping through the gap between walkway and road and rather closer to the road than the walkway and very close to the upright stone columns. Turning and flying back towards my spot over the Tower of London they headed westwards again over Southwark, and then swept back to line up again for a second run. Some tourists on a bus getting an unusual set of souvenir photos. Flypast repeated again – and this time I could hear cheers and shouts from bystanders, who were possibly stunned into silence the first time. I didn’t hum a tune by Wagner when they flew past again. Nope, certainly not! 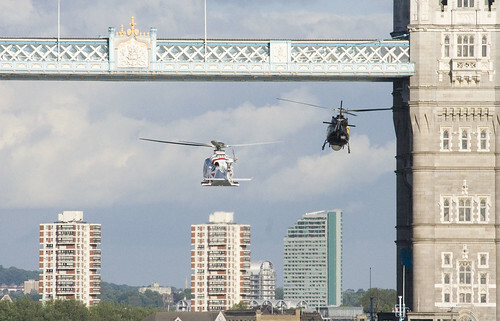 The helicopters then flew off into the distance and time to head over to Potters Field where I knew others were taking photos – and after stopping to get a drink, got to a closed Tower Bridge. Nope, not closed for a boat to go through – but the helicopters had come back for a third flypast. If I had got there just minute earlier and I could have got a good photo of them going through the bridge. Gah! It later turned out that the filming helicopter came back again an hour later to take some more footage, which had I known about would have hung around for closer photos by the Bridge. But that’s the risk with these sorts of events – the film crews rarely give out enough information for photography, probably to deter large crowds from arriving and spoiling their work. Here is a video by Baynes Media of what looked like the second fly through. Nice shots Ian, some of the best I have seen of this. Very cool! So… what movie is it they’re filming for? Current favourite rumour is film footage for the Olympics opening ceremony. After a few passes I relocated just downstream of the bridge, and found myself standing next to Danny Boyle directing a small camera crew who I’d guess were doing more “making of” filming rather than the key shots. So definitely Opening Ceremony. I hope Danny’s apologised to Shakespeare’s Globe, as Henry V seemed a bit pissed off with non-stop flyovers. Thanks for the tip-off Ian. Well – as long as it’s not for a Red Bull advert – I’m glad this was in aid of something because the irritatingly loud helicopter buzzing round the river yesterday evening did get on my wick a bit. I was on the Southbank, by the Royal Festival Hall and it was in earshot for a good 15 – 20 minutes. Pretty sure it was the white one shown in your photos. I’d assumed it was some sort of sightseeing flight. 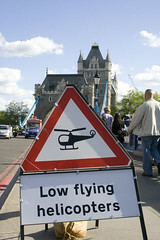 2 Pings/Trackbacks for "Photos – Helicopters flying through Tower Bridge"